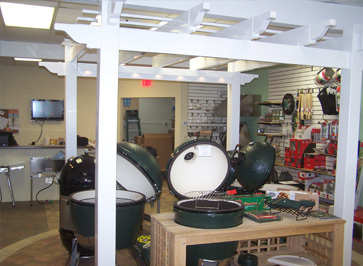 Outdoor kitchen design and building is our specialty. In house design services will meet with you on your patio and ask the right questions to assure the design is right for you. A 3-D color rendering of your design will be presented for your review along with a detailed quote of our proposal. We build our outdoor kitchens the same way your builder constructed your home. Concrete block and cement is the only true way to assure long standing construction that meets today’s strict building codes. We meet all 140MPH South Florida wind requirements with our construction. WE ARE LICENCED AND INSURED AND PULL BUILDING PERMITS FOR ALL JOBS. Stop in to our show room and experience the possibilities!